We live in a world that continually shows us the worst of humanity; whether it be tyrants killing civilians, riots in London, or childish bickering among legislators in Washington. Every day we are told that something bad, or even horrible has happened, but rarely are we reminded of humanity's strength and magnificence. Rarely are we reminded that we have and continue to accomplish amazing feats every single day. There are so many great, fantastic, and unbelievably selfless things that humanity has done and achieved. 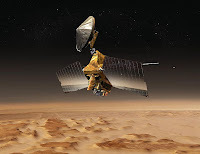 Some of these remarkable achievements can be seen in our exploration of Mars. 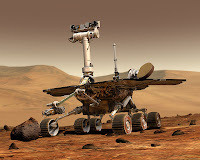 Humanity designed a pair of rovers (Mars Exploration Rovers Spirit and Opportunity) and sent them to Mars. We have used them to traverse miles of the alien terrain for years. It is remarkable enough that we have set objects on another planet, but the fact that we are using them to send footage of that planet back to Earth is astounding. We can now examine rocks on another planet. That would have been unimaginable less than a century ago. Is this not a remarkable feat? We have also sent the Mars Reconnaissance Orbiter to Mars where it has taken thousands of high definition photos of the planet. These photos, along with those from other orbiters, have been put together to allow the average person to explore Mars from the comfort of their living room through revolutionary software like Google Mars. Is this not an amazing accomplishment? Just 10 years ago NASA didn't have the images of Mars that every person has access to on their personal computer today. This in and of itself is an unbelievable accomplishment. The fact that we now have evidence that salt water is currently flowing on Mars is testament to the remarkable discoveries and accomplishments that humanity is capable of making. There have been many more accomplishments made by exploring Mars, all of which show the enduring and determined nature of the human spirit. These accomplishments show that humanity can accomplish anything we set our minds to, but more importantly they show that, as a species, we are better than some of our less exemplary individuals. It is unfortunate that humanity's achievements are not heralded as much as our failings are broadcast, but this disproportionate representation does not mean that our accomplishments are less than our shortcomings. If ever you start despairing about the current state of humanity, take a look at Google Mars or the images from Spirit and Opportunity and remember that the human race is performing countless great feats every single day.